Hyper Static Union can be booked through this site. Hyper Static Union entertainment booking site. Hyper Static Union is available for public concerts and events. Hyper Static Union can be booked for private events and Hyper Static Union can be booked for corporate events and meetings through this Hyper Static Union booking page. Unlike most middle agents that would mark up the performance or appearance fee for Hyper Static Union, we act as YOUR agent in securing Hyper Static Union at the best possible price. We go over the rider for Hyper Static Union and work directly with Hyper Static Union or the responsible agent for Hyper Static Union to secure the talent for your event. We become YOUR agent, representing YOU, the buyer. In fact, in most cases we can negotiate for the acquisition of Hyper Static Union for international dates and newer promoters providing you meet professional requirements. Meet Hyper Static Union, a musical force of nature so good that it incited Third Day's members to add more work to their overflowing plates with the formation of Consuming Fire Productions. And it's Hyper Static Union that prompted Rocketown Records to finally launch its long-planned modern rock imprint, RKT Music. Hailing from Camas, Wash., Hyper Static Union was birthed in Northwest garages and raised on a heavy diet of classic R&B and melodic rock. The four-piece modern rock band was first discovered by Third Day when mutual friends on the West Coast shared HSU's early demos with the Grammy-winning band. Producer Mac Powell (Third Day/Consuming Fire Productions) says, This band is unlike any other out there. Shawn Lewis is hands down the most talented guy I know. And still, it's not just one of those bands with a main guy surrounded by whoever just to fill in the holes. Each guy brings such a vital part that adds to an exciting sound and live performance. People can expect to be rocked by the music and challenged as well by a lyric that is not compromised or stale. This is something totally original. Impressed by the music as well as the character of the HSU members, Powell and his band mates chose Hyper Static to be the first release from their own Consuming Fire Productions. In addition, Consuming Fire Productions recently forged a deal with new Rocketown Records imprint, RKT, to market and distribute HSU's debut, Lifegiver. 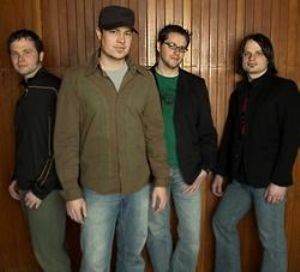 It's not easy to describe what listeners can expect from this unique new band and their Spring 2006 national release, in part because each member brings such distinct talents and influences to the table to create an inviting and cohesive whole. In fact, Hyper Static Union's Shawn Lewis (guitar/vocals), Ray Burnham (drums), Mike Jackson (bass) and Bryan Albrechtson (guitar) will tell you that their influences range from Lenny Kravitz to Led Zeppelin to James Brown, making it easy to see why they don't want to limit their sound to just one definition. Instead, their extensive musical backgrounds meld into an original style all their own. HSU frontman Shawn Lewis says, Ultimately we are about the craft of songwriting, and occasionally we are able to incorporate all things funk and rock into a sensible, three-and-a-half minute package laced with a passionate melody. We feel inclined to produce music that requires people to 'tune-in' mentally and spiritually. We want the audience to consider certain things about their salvation, the state of the world, their hearts and their relationships. Musically, audiences nationwide will first be introduced to the music of Hyper Static Union this spring with the release of Overhead and Praying for Sunny Day as singles to Christian radio. Tour dates throughout March and April will bring live connections, and then the full album, Lifegiver, releases in stores and digitally nationwide in late Spring. Lifegiver is a really exciting record, says Consuming Fire's Brad Avery (Third Day). The songs and sounds are fresh. The melodies are catchy, and this record rocks. These guys are great at weaving so many cool elements together, blending heavy rock guitars, soulful vocals, and infectious grooves to create something original and refreshing. Not only can these guys deliver in the studio, but they also have an incredible live show. For HSU, delivering quality musicianship serves a deeper purpose, communicating a deep and profound faith in the midst of a troubled world. Even the band's namea play on the theological term hypostatic union, which refers to Jesus' existence as both fully man and fully Godindicates their willingness to explore all aspects of life in their music, the human and the divine. We hope to communicate the sheer joy and beauty of God through loud guitars, says Jackson. I think that our audience will be broad because we bring something musically different to the table. And because our music is different, we can attract the attention of anyone who loves music, believers or not. I hope that by living Christ-centered lives God will enable us to be an example to all. Book Hyper Static Union here! Book Hyper Static Union for your next event! Would you like to have Hyper Static Union perform at your next corporate event, party or concert? Simply fill out the simple interest form below, and we’ll start the booking process.